Of major concern to the United States today is whether Australia’s new and largely inexperienced government will seek to water down the strong support that Australia has shown to American foreign policy over the past decade and more. Of concern to many Australians is whether a new administration in America will give any guarantee of the continuance of Washington’s past involvement in support of Australia’s defense and security within the vast Asia Pacific rim. The White House and the Pentagon are keen to have clarified just how Australia plans to approach the recommendations made in a white paper on Australia’s defense and security produced in the early days of the Rudd government. Professor Ross Babbage, adviser to Australia’s Defense Minister Joel Fitzgibbon and a co-author of the white paper, has called for a massive upgrading of Australia’s defense capability. Writing for the Kokoda Foundation, Babbage highlighted the “markedly altered future we seem likely to face.” He warned that Australia’s most significant challenge will, in all probability, arise from Asian powers to its north. Pointing to the rapid growth being experienced by Indonesia, India and China, the professor declared, “Nevertheless, despite the myriad uncertainties, the seemingly irresistible strategic tide with which Australian defense planners will need to come to terms is that the country will be walking among giants, some of whom may not be friendly” (Age, March 24). The gap in Australia’s defense capability is quite significant when one compares the sum of its total national power to the collective national power of all of the nations arrayed to its north. Within that context, Australia is a non-nuclear-armed minnow floating on the southern rim of a rapidly expanding nuclear-enabled East Asian bloc. Australia is aligned neither culturally nor ideologically with its northern neighbors. Though the nation’s land mass is impressive, it lacks the population to mount any military force of real significance compared in numbers to the teeming masses of greater Asia. Australia’s trade imbalance with Asia is huge. Its dependence on Asian nations, particularly China and Japan, as customers for its prime source of wealth—mineral resources—is excessive. A strategic challenge to both Australia and its Asian customers is that its port facilities have proven inadequate to handle the huge demands for its raw materials, especially from China. Already involved in ownership and operation of Brisbane Container Terminals on Australia’s east coast, China would like to exploit Australia to its own strategic advantage by developing seaports on the island continent’s western coast to speed up loading and delivery of Western Australia’s iron ore and bauxite. This strategy is of similar nature to China’s development of the Port of Gwadar, built on Pakistan’s coastline, to give China strategic access to the Persian Gulf and Middle East oil resources. Since the time that Australia was threatened by invasion from Japan in World War ii, the nation has relied largely upon the good graces of its big brother and fellow Anglo-Saxon nation, the United States, to shore up its security within the Pacific region. This strategic alliance has given America a friendly base for its Asian and South Pacific operations in exchange for Australian troop commitments in numerous combat zones and for support in its Asia-Pacific diplomacy. Australia’s increasing importance to American strategy in the Pacific and East Asia was given even more emphasis in the run-up to President Bush’s visit to the country in 2007. As Stratfor wrote at the time, “The United States and Australia signed the Defense Trade Cooperation Treaty on September 5, ahead of the Asia-Pacific Economic Cooperation (apec) summit in Sydney on September 8-9. The agreement is similar to one London and Washington signed June 27. The treaty, a small piece of a bigger picture, illustrates Australia’s increasing prominence in U.S. strategic thinking—a prominence that will continue to grow until Australia is on par with the United Kingdom as a U.S. ally” (Sept. 5, 2007). The significance of the signing of that treaty by the U.S. and Australia is borne out by the fact that, as Stratfor highlighted, “Canberra fully intends to leverage this closer legal standing in order to secure its own regional military dominance” (ibid.). It will be interesting to see the extent to which Prime Minister Rudd uses this leverage effectively to help close Australia’s defense gap. What will be of even greater interest is the extent to which a new U.S. administration will feel bound to honor the spirit of a treaty signed by two leaders who, at the time, demonstrated strong commitment to each other’s defense commitments, yet who are no longer in office. There are four key changes in the Far East that have Washington defense strategists deeply concerned: the increasing dominance of China, including its penetration of Australia’s key mineral resources market; Australia’s decreasing ability to protect the forces of democracy in the region; Russia’s refined focus on the region, including efforts to buy into strategic Australian mineral resources such as uranium; and the overt effort of Asian institutions such as asean Plus Three (asean, China, Japan and South Korea) and the East Asia Summit to block the U.S. from entering dialogue in the region and work to bend Washington to the East Asian powers’ will. The immediate challenge that Australia faces right now in relation to national security is significantly one of ideology. The Defense Trade Cooperation Treaty was drawn up under, and signed by, two conservative leaders: President Bush entering his last year in office and John Howard within months of his being voted out of office in Australia. Australia has since swung left, with Prime Minister Rudd immediately following through on his promise to withdraw Aussie troops from Iraq—not a good sign in terms of continued support to U.S. defense initiatives. A swing to the left by the American electorate could have additional huge impact on U.S.-Australian defense cooperation. It may even lead to a more isolationist America, leading to a drawdown of U.S. military commitments in the Asia Pacific region, leaving the door wide open for Asian powers to fill any vacuum thus created. Perhaps Professor Babbage has this in mind when he referred to the “markedly altered future we seem likely to face.” Either way, his call for a drastic escalation in defense spending to close the gap in Australia’s current defense capability certainly had the ring of urgency about it. That gap was revealed some 10 years ago during Australia’s involvement in quelling anti-government ructions in East Timor, an island nation barely 600 kilometers from Australia’s northernmost city of Darwin. The Australian Air Force and Navy proved incapable of the timely transfer of equipment and personnel needed for the operation. The gap in logistics, technology and, crucially, personnel in Australia’s defense forces, as compared to the Asian powers, has continued to widen ever since. Australia’s navy, faced with securing a coastline almost 60,000 kilometers long, of which 40 percent encircles islands, simply does not have the sea power to cope with its task. By way of example, in terms of Australia’s submarine fleet alone, Babbage called for “30 submarines … at a time when the crew-strapped Royal Australian Navy can barely keep three Collins Class subs operating out of a fleet of six” (Australian, March 25, 2008). Two powers presently eye each other as prospective replacements for U.S. dominance in Asia and the Pacific: Japan, possessing a blue-water navy second only to America’s, and China, a nuclear-armed nation, possessor of most of the Pacific’s major seaports. Ever watchful of the foreign policies of these two nations is India, which is rapidly building its own naval force, not to mention Russia, revitalizing its rusting hulks and adding new naval hardware to its nuclear fleet. Then there are the 200 million Indonesians just east of Timor. Indonesia possesses a navy with personnel strength three times that of Australia. The lengths to which Australia would have to go to achieve any semblance of real strength in the face of any threat from Asia is reflected in Professor Babbage’s call for expenditure to cover a “Massively restructured Australian Defense Force equipped with a fleet of 400 advanced combat aircraft and 30 submarines … needed to provide for the nation’s security and counter the rise of Asian powers” (op. cit.). Added to the question of Australia’s defense gap is the matter of just how prepared the nation is to ensure its own internal security. With such a mix of immigrants from Asia and the Middle East having settled in the southern continent—many totally uncommitted to becoming acculturated into Australian society—a possible elevation of fifth-column activities within the country poses an increasing risk. Though largely kept at bay by the previous conservative government for over a decade, the more politically correct policies of the Rudd government are likely to allow individuals and organizations that work against Australia’s interests to begin to raise their heads. Any dream of Australia being isolated from the Islamic terrorist crusade was shattered when police in Sydney and Melbourne uncovered a major terrorist plot in 2005. On November 8 that year, 17 people were arrested when 600 police raided 23 locations in the two Australian cities. Though the terrorists’ scheme was foiled, the incident indicates the extent of the homegrown terrorist problem Australia faces. Australia’s immigration policies of recent years—and the freedoms awarded immigrants without any demand for corresponding responsibilities to the Australian community—have produced a climate ripe for the growth of Islamic extremism. Australia became the enemy of Islamic terrorists when it joined with the United States and Britain in the war on terror. Although this island nation has yet to experience a terrorist strike within its coasts, Muslim terror has certainly struck Australians very close to home. The bombing of a nightclub in Bali, Indonesia, in October 2002 took the lives of 88 Australian citizens. Since then, the Australian government has stepped up its counterterrorist efforts. With its vast interior and far north filled with wide open, empty spaces, its massive coastline largely porous, and a scant population barely surpassing that of greater Los Angeles spread largely around the perimeter of a landmass as big as the U.S., Australia faces unique challenges in keeping terrorists at bay. Australia’s population was built by the migration of peoples from foreign shores. Yet because of its original “White Australia” policy, the bulk of the nation’s immigrants up to the mid-20th century came from Britain and Europe. During the heady days of the 1960s and ’70s, the intelligentsia of the nation exaggerated and publicized myths about the mistreatment of ethnic groups within Australia, leading to a change in the government’s stance on immigration. By comparison with other nations, Australia’s absorption of ethnic minorities has been relatively smooth. Following federation, generations of Australians came to the nation’s shores from cultures quite foreign to that of their new homeland. Their progeny readily accepted Australian citizenship and, thus, Australian national aspirations. That all began to change in the wake of war in Vietnam. Following the Vietnam War, boatloads of Asians penetrated the northern shores of Australia and were absorbed into its society. Buddhist temples, something quite alien to the Australian Judeo-Christian culture, started to pop up around the country. This was later followed by waves of Islamic immigrants from the Middle East. Mosques appeared and the cries of the mullahs were heard ringing out across the cities of Australian suburbs mixing with the bleating of sacrificial goats being slaughtered in suburban backyards. The entire culture of the nation began to change from its Anglo-Saxon foundation to reflect the policies of multiculturalism. Among those arrested on Nov. 8, 2005, were some Australian citizens. None were Australian ethnics. The culture and the religion they practiced were foreign to the majority within the nation of their citizenship. They had not assimilated. Like their compatriots in Britain and Europe, they elected to use the freedoms granted by their citizenship to perpetrate terror on the nation that granted them a haven from other societies still stuck in a medieval culture of cruelty toward, and deprivation of, their citizenry. Their extremist loyalty to the cause of pan-Islamism via jihad poses a real threat to the nation that feeds, clothes, shelters and educates them, and provides them with a means to make a living. The insurgents arrested in Melbourne and Sydney were charged with participating in paramilitary training in remote areas of Australia, planning to produce bombs and using firearms and funding for their nefarious operations. Although Australian authorities broke this cell before it struck, one is forced to wonder just how many other such cells may be yet embedded within this vast island nation. Yet Australia’s greatest challenge is not so much keeping extremist imams and their terrorist protégés from migrating into the country. The most significant terrorist potential lies within the hearts of extremist Islamic Australian citizens already embedded within that continent—the sons of earlier migrants, who speak with an Aussie twang but who will never assimilate into Australian society. Of such is the stranger within Australia’s gates mentioned in Deuteronomy 28:43! Match that prophecy with Deuteronomy 32:25, and it is clear to those with a perspective on the biblical identity of Australia, and on the prophecies for these times in which we now live, that the future does not bode well for Australia in respect of this terrorist threat. If you want to know why, turn to Leviticus 26 and read verses 14-16. That’s not a message for the faint-hearted. Nevertheless, it’s the binding reality of our day. Australia stands at a crucial crossroad as U.S. power wanes. Will its Mandarin-speaking prime minister be able to hold the balance against an increasingly expanding China with its voracious appetite for Australia’s raw materials? What of Russia increasingly eyeing those resources, in particular the raw material for nuclear power, uranium? Then there is Japan, traditionally a hard bargainer when it comes to dealing with Australian business, now competing directly with China for Australia’s mineral wealth. You can order a free copy of our booklet Russia and China in Prophecy to get a biblical perspective on how Asia’s future may affect Australia. In the face of all this, little notice is being taken of another contender for a slice of Australia, one that sees the southern island continent as an ideal platform to expand its own interests into Asia and the Pacific as U.S. power in the region increasingly weakens. That power is Germany. As German-Foreign-Policy.com reported some years ago, “With the takeover of Australia’s second-largest construction company, the Bilfinger Berger ag is continuing its expansion abroad. To the German economy and Berlin’s foreign policy, the country [Australia] represents a springboard to all of Southeast Asia, where Berlin wants to exercise its influence against the diminishing hegemony of the usa and the coming great power of China. The dominating position of the Anglo-American states in Australia is said to deprive Berlin of a formerly effective instrument for creating bonds of long duration between the Southeast Asian elites and Germany” (Nov. 3, 2003). Surprisingly, while Canberra gazes fixatedly on Asia—being particularly concerned about Australia’s relations with China at this moment—quietly in the background the greatest single trading bloc on Earth, the German-dominated European Union, is steadily making inroads into Australian business, finance and industry, with a view to exploiting Australia for its own ends as it seeks to gain increasing influence in the greater Asia Pacific region. You will hear more of this in the news in the months and years ahead. 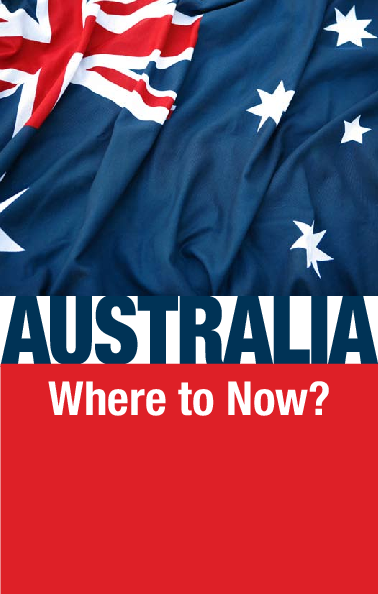 To study more about Australia’s immediate future, request a copy, gratis, of Germany and the Holy Roman Empire. The time is fast approaching when the continent of Australia will be caught in the crossfire between two great, economically and militarily expanding power blocs, the European Union and a great pan-Asian bloc.